I wrote about my distaste for Short Sales (aka Fake Listings), and how only 5% close in Northern Virginia (as of 2-08, but that might be changing). I guess now my distaste has shifted away from Short Sales, and more toward clueless agents listings Short Sales incorrectly. Top 10 Questions to ask the listing agent BEFORE showing A Northern Virginia Short Sale. Here is the exact e-mail I send to the listing agent of a short sale. Feel free to copy and paste this. I have a possible buyer considering your short sale listing. Our company policy is to ask for more information from the listing agent before showing any Short Sales. Have you closed a Short Sale before? Have you requested and received the short sale package from the bank, including the hardship letter? Have you sent the package AND have you confirmed receipt? What communications, if any, have you had with the bank? Has the bank approved the list price? Have you received any other offers that you are waiting to hear back from the bank on? Is there one or two trusts? Any other liens? What are the names of the banks? Are these FHA or VA loans? How long do you estimate that the lender will take to provide an answer to an offer? (new) Has your seller completely stopped making payments on their loan. Am I missing anything? Please add more in the comments. I recently sent this to 10 listing agents. Only three replied. Only one really knew what they were doing. The winner was Realtor John Ryan in Woodbridge. Have you received any other offers? Yes, however we are only a few days into the process with the new offer. All other previous offers dropped off. Have you closed a short sale before? Yes, several. I also have a dedicated team of five people that work the banks to get these through. I can give you feedback along the way so that you can keep your buyers informed. So I hereby lift my ban on Short Sales on the buying side. As for the listing side, after an eight hour NVAR CE class, from a group that gets a 90 percent close ratio, I have no problem taking them on (if the seller qualifies). Don’t want a short sale? Send it my way. Also at the most recent Finance Committee meeting at NVAR, we passed a resolution to consider enacting some sort of Short Sale ____ (certificate, pledge, designation) for those that know what they are doing with Short Sales, so they can put it in the MLS Remarks and buyers can have more comfort. Update 11-14-08- I added question #11. Why would a bank agree to take a $100,000 hit if the seller is somehow able to figure out a way to pay every month? Sometimes they try to trick sellers by saying “We will consider a short sale, if you keep paying on time.” Yeah right. Squeeze out another 3 months in payments and then foreclose once they stop. Frank, I just told my buyer agent these same questions to ask the other day on a short sale. I have now forwarded it to my team. Thanks, excellent advice and so important to know up front. Frank–Funny that you posted this…I just saw another post on the exact same topic. I have clients that really want to look at a few of these but have strict timing issues so I asked some of these very questions. Of course the answers are very vague in most cases but every once in a while a savvy agent has done his/her homework prior to listing. Unfortunately this is not the norm so no I have not had any luck in closing a short sale and will continue to counsel my clients about the pitfalls. Frank, don’t forget to ask how they got their price and if there are comps to back it up?!!! Some agents pull a price out of thin air!! You may want to ask if there are one or two trusts. If there are two are they with the same mortgage company? That is a nice list..I will have my team use this as well. Frank – what do you do with this info once you get it. For example, are there dealbreakers on the list (meaning some answers are more important than others?) If a loan was an FHA or VA loan, then what? If there is PMI on the house, then are you more or less likely to continue with the process and why? Well the first test is if they even reply. Many of these Listing Agents are clueless and that tends to be consistent with not replying. If they do reply, if the loan has PMI, that is crucial information since the bank might PREFER that it go to foreclosure for them to get a better pay off. Also there might be another person to contact to negotiate the deal (like 2 lenders). And it allows a follow up “Ok, it has PMI, what are you doing about it.” If they answer “dunno” you know the deal isn’t going to happen, unless your buyer agent takes over the process. As the home being bought initially as an FHA vs Conventional, there is a completely different application process. If the listing agent doesn’t know this, again, the buyer agent has to take over and school them or just walk since overall agents close 1 in 20, clueless agents close 1 in 100 (my guess) and knowledgeable listing agents can close 90%. I’m 0 for 5 with my buyers, and I now I think I know why. 3 of the 5 the bank REFUSED any short sale offer, as they SELLER didn’t qualify since they had assets and income that would have supported the mortgage. Seller’s who are just walking away from a rental or investment won’t be eligible if they have assets. Sad but true – most agents really don’t know how to negotiate and close a short sale successfully. Most of the time the buyer walks and the deal falls apart. Did you know that over 405,000 homeowners lost their home in 2007 – a whopping 57% increase over 2006? Even more staggering, over 1% of all U.S. homeowners were in some stage of foreclosure during 2007. And recently, we have just learned that there are over 1 million homes in foreclosure right now! So is there a way out of this dilemma? Absolutely. And it’s called a “short sale.” It’s just too bad there aren’t enough trained agents that know what to do. As a person of strong character and high moral values, I have a great deal of compassion for those families who find themselves in a personal crisis – staring foreclosure in the face and not knowing what to do. 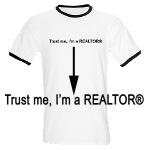 They absolutely need a true real estate expert who can step up and educate them about all their options. There is one organization that is leading the charge in developing professional short sale experts – RealtyU. RealtyU, in cooperation with over 36 real estate schools nationwide, have created the official Certified Short-Sale Professional (CSP) course to teach agents how to successfully negotiate and close more short sale transactions. Find out more at http://www.cspdesignation.com. The Washington Post just did a story on this. They said I ask these Top 10 question before putting in an offer. She meant, before I even show it! I’ve been a real estate investor (i.e. not a speculator) since 2003 and I’ve been licensed in MD since 2007. I performed 8 short sales before I ever became an agent. My buyers often get excited when they see a short sale listing and how attractively it is priced. Instead of a short sale property having a listing price of $450,000 ; it should say “Your guess is as good as mine”. The truth is that most listing agents have not even started the short sale process and are just looking for an offer to get it started. Let another buyer make that offer, there are too many good deals on the market to have your buyers waiting for 3 months just to get an approval…at 8% higher than the list price! Has the BPO (Broker Price Opinion been performed), if so what was the result? Do you have a WRITTEN short sale approval? Great information, This can be very usefull…. OK. this is depressing. My broker works for XYZ and did not even provide info on these questions. I have placed an offer for a short sale but it now seems I can either wait. The owner has accepted my offer but now the lender has control over the sale. From research and my broker’s feedback, I may have to wait up to six months or simply find another property. My wife and I are now looking for other properties, even though we like the short-sale property. Lenders need to know they are costing themselves money by delaying sales on properties which may go into foreclosure. Foreclosure will rarely be to the benefit to the lender and a short sale may recoup more funds. Lenders, wake up as you are the enemy driving your companies into financial distress. These are MY questions. These are not the questions being passed around by other firms. They SHOULD be, but they aren’t. Many brokers have told me that they have printed out these questions and given them to their agents. As for your short sale, it is not too late to ask these questions. Why not just wait for the house to relist as a REO in a few months? As for the seller signing, that really doesn’t matter. They are irrelevant. They would sign for a $100 sale. As for the banks, read my other post on Short Sales to understand why sometimes they would RATHER go to foreclosure. If the listing agent has never closed a short sale, move on. You don’t like the house, you like the house at this artificially low price. My understanding is that once a offer is accepted and ratified by the bank, that despite two other back up offers at higher prices the ratified deal goes through. the house is in Virginia, but apparently the lender is another state. I told my buyers agenet, I found it hard to believe that the first offer would go through, if the bank knows there are two other offers that are higher. She made the statement that there was a contract and that they had to have integrity and could be sued. I find the process confusing. we bid in June for a property in Loudoun Co, and have had conflicting information from the sellers’ agent on where each bank is in the process. NOW she says that CitiMortgage (2nd lender) is asking the sellers for $17k to release the sale. The sellers have offered $7000, and we’re hoping Citi accepts. If they don’t, well, they get absolutely nothing if the property goes into foreclosure. We have no idea where Indy Mac (main lender) is in the sale process. In the meantime, we have seen several properties we would have bid on, had we not had a bid already on another property. I haven’t heard a 2nd ask for so much. So these other homes that you would have offered on, were they better? Were they bank owned (ie clean)? Why not pull your offer and offer on a bank property instead of sticking with the short? Thanks for this great list and all the other super data you’ve shared. I’ve linked to this post and done my own 10 questions…thanks again for the awesome data! As licensed Broker in Maryland I am encountering many instances of what I call “bait” pricing. It’s difficult to counsel buyers who get excited about a property they see advertised at a price a lender had nothing to do with setting let alone accept it. Again~ how are listing agents coming up with the pricing is a topic all on it’s own and one of many factors to weigh your clients time and perserverance. As for those completely unrealistic lowball offering prices… if there is no systematic history of price reductions then more then likely.. it’s a waste of time. — My biggest hangup when working with buyers is “Baiting”. Hello all! Thank you for all the posts, they are all very helpful. I just wanted to share my situation with you and maybe get a piece of specific advice. So,long story short my wife and I put a contract on a short-sale house 2 months ago. My real-estate agent did not hear from the short-sale listing agent for about 1.5 months, until she heard from another listing agent who replaced the initial one (for unexplained reasons). The second listing agent then told us that the owner approved our offer and sent it, along with other 2 offers, to the bank. However,according to my agent, the property is still active on MRIS. Thus, my questions are: is it normal that the property remains active? Can anyone at this point affect the decision-making process at the bank that actually owns the property? Is it worth waiting for the property if we waited for as long as two months already? I would greatly appreciate any advice from the blog participants! Hey Anonymous, While I would love to help you, I can’t. You are represented by a Realtor, so I can not give you specific feedback. You can read my first blogpost on Short Sales that talks about how one can keep a listing active and have multiple contracts. And of course… did you get the answers to the Top 10 questions here? Will you be updating this topic again? Last entry was in March 09 and it’s now November 09. Hey Dorothy, It’s still pretty relevant. The fact is if they can’t provide it withing a day or two then they don’t have it and there is no telling when they will get it, if they don’t know what it is then they don’t have a deal. My favorite thought is “the seller doesn’t want to give up that information” We have found that generally means the seller doesn’t really have a hardship, and probably won’t qualify for the short sale. Basically anything short of providing the hardship package means move on. Hello. I am in a short sale nightmare and ended up here. In April I agreed to purchase a property which was already “bank approved” for a short sale. But the day we were supposed to sign, a problem occurred. The property appraiser on the “sellers” side quoted the appraisal $13000 over the agreed short sale price. So a re-appraisal had to be done and delayed everything for a month. Now we’re in June, and the bank approving the “short sale” is demanding money from the seller, and has effectively stopped everything. Did I get suckered into a deal that will not happen?